Following its successful voyage to 2018's European cultural capital Malta and to UNESCO Headquarters in Paris, "The Majlis - Cultures in Dialogue", a traveling cross-cultural exhibition that features a collection of the Sheikh Faisal bin Qassim Al-Thani Museum - a unique assembly of artefacts reflecting the interaction of civilizations in the past while encouraging dialogue in the present - moves to its next and third stop - Institut Du Monde Arabe in Paris, which opened to the public on January 8, 2019 and will remain on view through March 10, 2019. The cross-cultural exhibition will be showcasing carefully selected objects that illustrate different levels of culture while expanding the horizons of understanding and will be enriched by an open space for intriguing panel discussions. A new feature to the exhibition at the Institut Du Monde Arabe is the fact that it is enriched by contemporary art from the Institute's collection. Whilst the ancient antiques present the history of cultural integration, the new collection of contemporary art emphasizes the continuity and uninterruptedness of the inter-cultural dialogue. The highly esteemed Institut Du Monde Arabe is the perfect spot for this exhibition, since it was designed to create strong and durable cultural ties while cultivating constructive dialogue between the Arab World, France, and Europe. This cross-disciplinary space is the ideal place for the development of cultural projects, in collaboration with institutions, creators and thinkers from the Arab world and intends to make a distinctive contribution to the institutional cultural landscape. H.E. Jack Lang, President of the Institut du Monde Arabe, said: "It is a matter of great pride and honor for us to have joined hands with the organisers of such a unique and impactful exhibition, which is aimed at bringing together people and cultures by way of their heritage art forms. Institut du Monde Arabe follows the same philosophy and works towards creating a better understanding between the Arab world and our continent. We are confident that Institut du Monde Arabe will further facilitate a strong cultural bond that the Majlis intends of achieve. Together, we are going to take this movement to the level it deserves." "Since its inception, the intent of this travelling cross-cultural exhibition has been to spread the message of peace, prosperity, understanding each other's cultures, believing in co-existence and becoming more tolerant. With this exhibition, we want to focus on the similarities that bind us as human beings belonging to different religions and cultures. These objectives are being perfectly enhanced in the artefacts, which we have selected to be displayed at the Institut Du Monde Arabe. It will actively serve the role of keeping alive the history, culture and traditions for the next generations to learn and draw from, as well as helping promote and sustain cultural dialogue in the different countries we will be visiting." 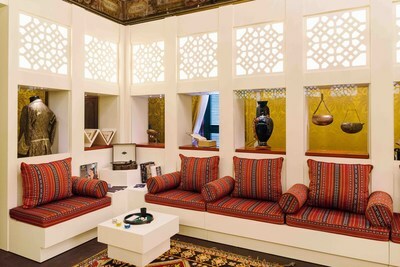 "The Majlis - Cultures in Dialogue" will travel to several European countries, showcasing a unique collection that reflects the interplay of civilizations in order to foster intercultural dialogue and a spirit of understanding, harmony and peace among people. Peoples heritage - their artefacts, handicrafts, arts and songs -contain all sorts of knowledge about the ideas and cultures that nations produce; they tell stories about social and religious phenomena as well as the customs and traditions that have prevailed in the lives of different people.